Wine lovers have the most stringent demands when it comes to storing their favourite wines. Many like to be able to enjoy their fine wines on the spur of the moment whilst others prefer a collection of wines over a longer term. Some of course want the best of both worlds and why not! Liebherr offers the very best premuimwine storage cabinets that guarantee perfect long term wine storage and serving temperatures whatever your requirements. With unsurpassed heating and cooling circuits plus top notch air filtration Liebherr wine cabinets offer unrivalled wine storage conditions. Offering either 2 or 3 individually controllable climate zones +5 degreesC and +20 degreesC and accurate to within +/- one degree. The Vinidor range offers great flexibility. This range facilitates the combined storage of red and white wines at the correct serving or long term storage temperatures. Wine storage cabinets offer similar conditions to a wine cellar. 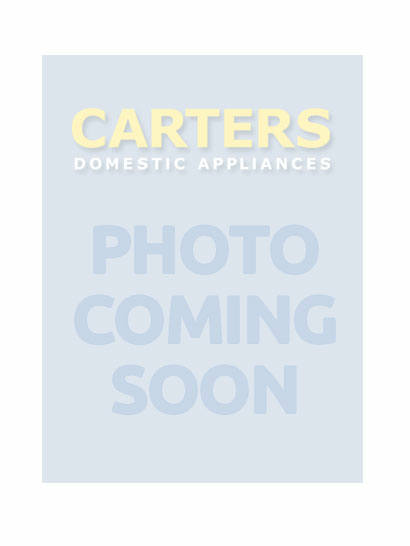 This range facilitates the storage of red and white wines at the correct long term storage temperatures or individual variety serving temperatures. The temperature can be adjusted from +5 degreesC to +20 degreesC as appropriate and is both even amd constant throughout the entire appliance interior. Multi temperature wine cabinets from the Vinothek range offer versatile storage for different types of wine, each at its perfect drinking temperature zone from up to +18 degreesC and down to +5 degreesC. In this way a variety of wines can be stored at the various correct serving temperatures. The electonic LCD display is an innovative design feature. Clear menu navigation and a TOUCH-ELECTRONIC CONTROL SYSTEM provides yet more information for tailored storage conditions. The digital temperature display can be read from the outside of appliances with glass doors. The Touch-electronic navigation ensures easy selection and use of the numerous control functions. The Vinidor 2 and 3 zone models feature an integrated door seal in the dividing shelf to maintain correct individual temperatures. The LED Lighting in the wine cooling compartments can be dimmed to give a pleasing ambient light inside the appliance. All Vinidor appliances are equiped with this innovative , no heat LED lighting concept. The LED lighting system can be adjusted to activate during door openings or to be on continuosly at various intensity settings depending on model. 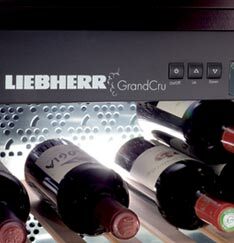 The tinted safety glass in the Liebherr wine cabinets guarantees the essential UV protection for your fine wines. The proactical aluminuim door handle with integrated opening mechanism, allows the door of the appliance to be opened conviently with a minimum of effort. The Vinidor appliances are equipped with solid wooden shelves mounted on telescopic rail. The handcrafted shelves made from untreated wood are ideal for storing Bordeaux bottles safely, providing a clear view ans aesy access. Storing bottles neck to neck facilitates maximum storage capacity. The clip on labelling system provides a quick and clear overview of your wine store. 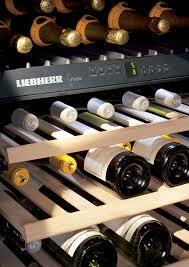 The practical presentation shelf of the Vinidor models fulfils both bottle storage and bottle presentation functions. The bottles can be stored horizontally at the back of the interior. The Softsystem feature provides added safety and convenience. 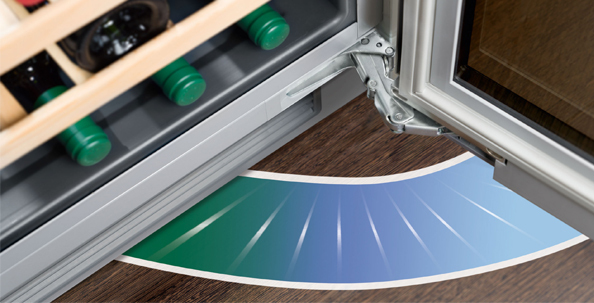 Integrated on the door, the Softsystem ensures the door closes gently even when fully loaded inside. The door automatically closes from an angle of aproximately 45 degrees.